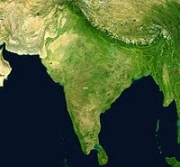 Ancient India GeographyThere were two distinct civilizations that existed in ancient India, one was the Indus valley civilization that flourished till 2500 BC and the other was the Gangetic valley civilization that began with the coming of the Aryans and its settlement beginning from 1500 BC. This is also known as Vedic Civilization. While it’s only the archaeological evidences that give the geographical location of the Indus valley civilization, it’s the compilation of the Vedic literature that gives the location of the Gangetic valley civilization. The Indus valley civilization was spread over to geographical location of some 1,260,000 km and was one of the largest civilizations in ancient times. The geographical location of Indus Valley Civilization is found from the excavated sites that roughly extends from North West region of India and extends to countries like Pakistan, Afghanistan and Iran. It flourished on the Indus river basin in north and extended up to Daimabad in Maharashtra in south. In the east it began from the Ghaggar- River valley, further to the upper reaches of Ganges-Yamuna Doab region. In the West it extended to the Makran coast of Balochistan. The exploration of Indus valley sites is going on from 1920 onwards in the general region of the Indus and Ghaggar-Hakra River and its tributaries. There are about 1,056 cities and settlements that have so far been discovered. Among them 96 sites have been excavated and includes Harappa, Ganeriwala, Mohenjo-Daro in Pakistan and Dholavira, Kalibangan, Rakhigarhi, Rupar, and Lothal in India. The Indus valley civilization had gradual decline from around 1800 BC and most of the cities were abandoned by around 1700 BC. The main reason for this is attributed to the migration of people from Central Asia region called the Aryans. The settlement of the Aryans mostly took place along the Ganjetic basin in the northern Indiam plains. The Rigveda, the oldest of the Vedas, was composed roughly between 1700 and 1100 BCE gives geographic location in the early Vedic settlement. This period ended about 500 BCE, and 150 BCE. The end of the Vedic period saw the rise of Mahajanapadas or kingdoms that well established the geography of ancient India. The geographical location of early period centred early on in the northern and north-western parts of the India, but later during the Mahajanapadas it extended to the whole of India, including south India. list of 10 streams The hymns of Vedas throw light on the course of Indo-Aryan migration and evidences of their geographical location. The hymns in praise of rivers sing the greatness of the Indus River and enumerate 19 rivers including the Ganges. The hymn mentions at list of 10 streams that include; Ganges, Yamuna, Saraswati, Satluj, Ravi, Chenab, Jhelum, Maruwardwan (in J&K), Sushoma (Rowalpindi District) and probably Kanshi in the same district. The Vedic hymns reveal the initial Aryan settlements in the western tributaries of the Indus, the Gomti (modern Gomal) the Krumu (modern Kurram) and the Kubha (modern Kabul). The one river mentioned in the North of Kabul is Suvastu (modern swat). However, the main focus of the Rig Vedic settlements was in the Punjab and the Doab region. Historians are of the view that when the Rig-Vedic hymns were compiled, the focus of Aryan settlement was the region between the Yamuna and the Sutlaj, south of modern Ambala and along the upper course of river Saraswati and only later the eastern region were known. 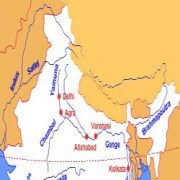 The most frequently rivers mentioned in Rig Veda are the Sindhu (Indus), the Sarasvati (modern Sarsuti), the Drishadvati (modern Chitang), and the five streams of the Punjab. The geographical features in the Vedic period as ascertained from the Rig Veda suggest the knowledge of the Himalayas but not of the Vindhayas Mountains. In the early Vedic period the land south of Yamuna was not known to the Aryans. This is borne by the fact that the river Ganga is mentioned only once that too in one late hymn in the Rig Veda. The people of the Vedic period also had no knowledge of the oceans as the word 'samudra' in the Vedic period meant a pool of water. Its only from the literature of the later Vedic period we learn that they knew the two seas. During the later period there is mention of the entire Indo-Gangetic plain as the geographical location comprising areas between the Himalayas and the Vindhyan mountains. The Vedic texts tell that the people who migrated from north expanded from the Punjab over the whole of western Uttar Pradesh and covered by the Ganga-Yamuna Doab. It’s learnt that the Bharatas and Purus known as Kuru people, first lived between Sarasvati and Drishadvati just on the fringe of the Doab. Soon the Kurus occupied Delhi and the upper portion of the Doab, that is the area called Kurukshetra. After that the Kurus joined with the people called Panchalas who occupied the middle portion of the Doab or the modern districts of Bareilly, Badaun and Farrukabad. The Kuru-Panchalas set up their capital at Hastinapur that was situated in the district of Meerut. Later the Kauravas and the Pandavas belonging to the same Kuru clan fought out a great war which led to the extinction of the Kuru clan. This story is vividly described in the book Mahabharat. The Aryans spread from the Doab further east to Kosala in Eastern U.P. and Vedeha in north Bihar around 600 B.C. The Mahajanapadas period existed between the sixth and third centuries BC. Ancient Buddhist texts like Anguttara Nikaya mentions sixteen great kingdoms and republics that flourished during the Mahajanapada period. These kingdoms stretched from Gandhara in the northwest to Anga in the east and included parts of the trans-Vindhyan region. They were; Kasis, Kosala, Trigarta, Anga, Magadha, Vajji or Vriji, Malla, Chedi or Cheti, Vamsa or Vatsa, Kuru, Panchala, Machcha or Matsya, Surasena, Assaka or Ashmaka, Avanti, Gandhara and Kamboja. The Kasis was located in the region around Varanasi. The country of Kosala comprised the region of Central and Eastern Uttar Pradesh, located about 60 miles north of modern Ayodhya on the border of Gonda and Behraich districts. Trigarta Kingdom was located in the Kangra district of Himachal Pradesh and extended westward towards Punjab. The exact geographical location of Anga is not known but the Atharva-Veda mention it along with the Magadhas, Gandharis and the Mujavats. What is known is Magadha king Bimbisar annexed Anga. Magadha was situated on the confluence of major rivers like Ganga, Son, Punpun and Gandak. Its capital was Pataliputra. The Vajjians or Virijis kingdom comprised of eight or nine confederated clans and was located in Mithila region in modern Janakpur district in Bihar. The Mallas/Malls kingdom consisted of nine territories; one of them was Kuśināra, modern Kasia near Gorakhpur, and the other was Pava (modern Padrauna, 12 miles from Kasia. The kingdom of the Chedis, Chetis had two locations one in the mountains of Nepal and the other in Bundelkhand near Kausambi. Vamsa or Vatsa corresponded with the territory of modern Allahabad in Uttar Pradesh. 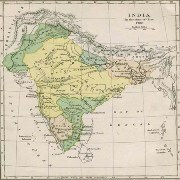 The country of the Kurus roughly corresponded to the modern Thanesar, Delhi and Meerut district. The Panchalas roughly occupied the region of modern Budaun, Farrukhabad and the adjoining districts of Uttar Pradesh. The country of the Matsya or Machcha corresponded to the regions of Jaipur in Rajasthan included the whole of Alwar with portions of Bharatpur. The country of the Surasenas corresponds roughly to the Brij region of Uttar Pradesh, Haryana and Rajasthan and Gwalior region of Madhya Pradesh. It had its capital at Madhura or Mathura. The country of Assaka or the Ashmaka was located in south of the Vindhya mountains on the banks of the river Godavari. The country of Avanti roughly corresponded to modern Malwa, Nimar and adjoining parts of the Madhya Pradesh. Its capital was Ujain. The Gandhara kingdom included Kashmir, territories of east Afghanistan, and north-west of the Panjab modern districts of Peshawar and Rawalpindi. Its capital was Takshasila a renowned centre of learning. The idea of Bharat that is India started taking shape since the time of Mahajanapadas. The sixteen kingdoms during the Mahajanapadas covered the entire length and breadth of India. It’s since then the entire geographical terrain of India became well known. It thus helped in solidifying the idea of Indian civilization.